Connecticut, like many states across the U.S., is facing its own recycling headwinds by examining ways to clean up contamination and boost recycling revenues for lower-value materials. And with a newly elected governor, a couple new initiatives have been proposed in the state. During the 2019 Connecticut Recycling Conference, hosted by the Connecticut Recyclers Coalition (CRC), speakers during a legislative panel discussed two proposals the state is considering under the new administration: expansion of the Connecticut bottle bill and Gov. Ned Lamont’s proposed 10-cent fee on plastic bags. 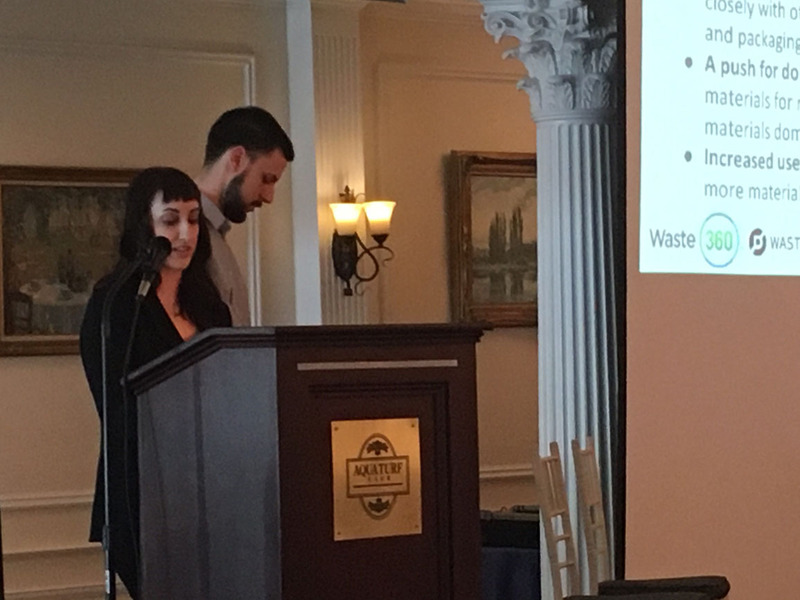 In addition to this panel discussion, among others, Waste360 Editorial Director Mallory Szczepanski and Waste Dive Senior Editor Cole Rosengren provided a recycling markets update. Here is a recap from the event, which was held at Aqua Turf in Plantsville, Conn.
Rep. Joe Gresko, who represents Connecticut’s 121st district, explained that the proposed bottle legislation is a placeholder bill that local and industry stakeholders are in the process of finetuning. Jennifer Heaton Jones, executive director of the Housatonic Resources Recovery Authority expressed her optimism regarding the governor’s support of the bill, as well as how CRC has been working with key stakeholders, like municipalities, haulers and materials recovery facilities (MRFs). “I think everyone is kind of tired of talking about it; they just want to see something done,” she said. Dan McGowan, CRC president, explained that across the state, there is still a lot of deposit material, like cans and bottles, in residential recycling bins. Louis Burch, program director for Government Relations at Citizens Campaign for the Environment (CCE), explained that CCE has been advocating for expansion on the bottle bill for a number of years. “Individual fixes and piecemeal solutions won’t fix the challenges we have with the struggling bottle bill, so we are looking for a more comprehensive approach to move our state into the 21st century,” noted Burch. Regarding Lamont’s proposed 10-cent fee on single-use plastic bags, Burch said CCE is pleased that the administration recognizes the problem with plastic bags and seeks a solution to reduce the amount of plastics pollution. He added, however, that the fix moving forward must be a hybrid solution. As a compromise, CCE and the groups it works with developed a solution of phasing out bags over time. CCE’s proposal, in conjunction with the food association and local groups, is to single-use plastic bags at checkout, while allowing retailers to keep the thicker bags that typically sell for 10 cents or so for a period of two years. Then after that period is over, grocers and retailers would be expected to be phase out plastic bags—or once an 8 percent reduction in plastic consumption has been achieved—whichever happens first. Since China’s implementation of National Sword in January 2018, recycling has been a consistent headwind for major waste management and recycling companies. At the state level, Rosengren said Waste Dive has seen state agencies take interesting actions to reduce contamination. For instance, he pointed to Colorado’s NextCycle program, a grant program in Michigan that awarded the state $15 million in recycling money and glass legislation in Washington state, among many others. “At Waste Dive, we do our best to track recycling changes down to the local level,” noted Rosengren. “We are also seeing some cities adding recyclable materials. For instance, Denver is adding coffee cups to its list. Since the implementation of China’s import ban, Szczepanski explained that a lot of people have asked about the future of recycling. She pointed to local and statewide policies that have been put in place, as well as various plastic pollution bills in California that were signed into law in September 2018. “California is paving the path and kind of leading by example for what other states can do,” she said. Another top priority across the country is reducing contamination, and that is going to take a lot of effort from all parties, said Szczepanski. Amid a stronger push for reducing and reusing, Szczepanski explained that the recycling industry has been working more closely with the packaging industry to ensure that products are made with end of life in mind. Plus, she noted, there has to be a greater push for domestic use of materials rather than relying on foreign markets. These challenges and efforts will be discussed in further detail at WasteExpo, May 6-9, in Las Vegas.